I'd like to start an Ellington-a-thon thread. Given this board is full of Ellington enthusiasts - some of very long standing - it seems an ideal place. And I expect we'll all be listening to lots of Ellington with the up-and-coming Mosaic in our minds. a) On Ellington versions (from the famous to those tucked away on live or private recordings) - anything from erudite analysis to simple personal reaction. b) On interpretations by other musicians. The list I have runs to nearly 2 000! So I'd put the less well known/celebrated up in batches, the really famous tracks on their own. In some respects it might be the less well known that would be most interesting to hear about. I'll be flexible about how frequently to introduce the next batch - if a really good debate is going I'll just delay; if it goes dead, the next batch goes up. Thought of starting with some well known pieces - 'East St. Louis Toodle-oo', 'Rockin' in Rhythm' and 'Take the A-Train' (all signature tunes at some point, I believe). Rather than posting chronologically or alphabetically I'll probably jumble them up to add an element of surprise. Probably keep Suites together, though inevitably some tunes will escape as they have a life on their own. So, is there enough interest to make this viable? Good idea, Bev. Look forward to listening/reading along. Let's do it. My one suggestion is that we do it like the BFT - otherwise the single thread will get too ungainly? OK - looks like a goer. There is the danger of it getting ungainly but lets try it fiirst and see how things go. We can modify later. I'll use this format to distinguish the introduction of the tunes from the responses. First heard Ellington version of 'East St. Louis Toodle-oo' on an RCA 3 CD compilation put out by the Sunday Times in the late 70s. But what brought me there was hearing Steely Dan do it on 'Pretzel Logic' a little earlier - wah-wah guitar replacing Bubber Miley! I doubt if I'm the only one of my age range who first heard Ellington there! I believe this was also recorded on other labels beside RCA - Decca (or a company that became or was absorbed by Decca?). Be interested to know if they differ much. Oh, man. You chose a tricky one to start. We'll have to talk matrix numbers here to keep track of the various versions! Bruyninckx lists 41 takes by Duke (or The Washingtonians, or Lonnie Johnson's Harlem Footwarmers) of "East St Louis Toodle-Oo" (or "East St Louis Toodle-o" or "Harlem Twist"). Many are unreleased. Of the (still many) that have been released, I seem to have a dozen or so, plus a half dozen covers by various groups. The one I keep coming back to as "the best" is the 1928 "Harlem Twist (East St. Louis Toodle-Oo)" on Okeh 8638 (matrix W. 400032-A). I have it on "The Okeh Ellington", which is an excellent collection. I'll try to listen to them all this week and see whether I have anything mildly interesting to say about any of them. Didn't realise there were so many. I just played back the RCA Dec 1927 version. Seems to have a rondo like structure (to use a classical term) the opening minor key episode interspersed with major key sections. I especially like Harry Carney's bit! both quite different from each other, neither are my favourite version. Better in my opinion is this one , although it too is slow but not as slow as the number above. anything from erudite analysis to simple personal reaction. It sounds to me like something that could only have been created during prohibition - with everybody dipping their toe in the forbidden, the constant exchange between major and minor. Like a chic party is going on upstairs, but all the patrons know who's supplying the liquor. I think there's a certain comic weirdness in it too, that Cab Calloway took to extremes - and like those early cartoons (Bimbo and Betty Boop and so on), fun but menacing like a pursuit of some sort (maybe a bear and a duck taking a stroll ). I reckon it's that floating 'ghosty' tuba sound against the muted trumpet - he certainly had those timbral colours going on anyway. only if it's Steve Ellington. When did Ellington drop this tune from his setlist? I've played fairly accurate transcriptions of it in the sax section of several different bands over the years and it's always enjoyable, whether on alto or tenor. o#One always felt a kind of euphoria when playing the 'Sister Kate' section after the clarinet solo. The piece alternates two themes; the first features the spooky minor melody that was apparently written by Bubber Miley, and is played by him on the early recordings. It has a major bridge, which I suspect was written by Ellington, to round it out to a standard 32-bar, AABA theme. The second theme is a raggy major tune, played by trombonist Tricky Sam Nanton on the earliest recordings. The first seven versions differ from each other in various ways; I’ll just say that most of the differences involved the second theme. The only real change that shows up in the first theme is the trombone countermelody for the bridge; it appears for the first time on the Brunswick version. But the second theme is constantly being revised: clarinet solos, bari sax solos, trombone solos, brass trios, clarinet/soprano sax duets, woodwind trios, all come and go in different versions. I think the reason for this is that Ellington sensed that the second theme was not up to the level of the first; it’s kind of corny, even for the 1920s. But the composer in him knew that the piece needed some contrast, so he kept it in, even as he kept changing the details in an attempt to find the magic formula which would make it work. My favorite of these early versions is the Victor, which captures the eerie feeling far better than any of the others. And the sound is amazing for 1927 – Victor had the best engineers in the business at the time; their 78s sound better than any other label. I also love the first version on Vocalion for its freshness – it probably messed some folks up when it was released. The 1930 Diva version (available on The Okeh Ellington) is pretty interesting. Miley is no longer in the band, and Ellington gives the first theme to the entire brass section, to great effect. The saxes take the bridge. Most of the composed melody of the second theme is gone, replaced by improvised solos and duets. I like it – it provides the needed contrast, but the solos and duets are hipper than Ellington’s raggy melody. The 1932 Victor recording is part of the famous stereo experiment which resulted in two long medleys. Only the first theme is included, with the full brass section featured again. It’s pretty awesome in stereo. The “New East St. Louis Toodle-Oo” from 1937 is the version Clunky has on a Brunswick 78. I like this one a lot – it’s slow and majestic in a way that no other version is. Cootie Williams takes the Miley role, and Ellington solves the problem of the second theme by eliminating it. By this time his compositional skill had developed to the point that he could conjure up enough different colors to provide the needed contrast. There is a trombone section variation (with clarinet obligato on the repeat) of the first theme in the spot where the second theme would go. A really nice reworking of the piece, in my opinion. “Toodle-Oo” is part of the medley of Ellington theme songs that the band played in the 1947 Carnegie Hall concerts. This is the slowest version yet, with Ray Nance on the first theme. Surprisingly, the second theme is back, but with a modern scoring featuring Harmon-muted brass and unison saxes. It works pretty well. After that, “East St. Louis Toodle-Oo” seems to have disappeared from the book for awhile. Ellington recorded it for Bethlehem in the mid 1950s, but I haven’t heard that version. It shows up again as a Cootie Williams feature in the middle of the sixties. The version I have from 1965 is a short, 32-bar version – the first theme only. It sounds like it might be a head arrangement - Cootie, the saxes, and rhythm section only. Sorry about the long post. I really enjoyed hearing all of these back to back. Jeff, I salute your insanity. The Bethlehem version from the mid-1950s is a favorite of mine. 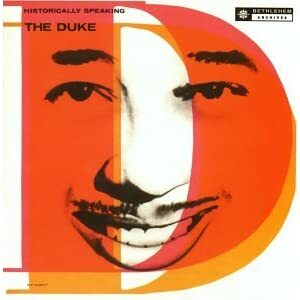 This is on one of the very first Duke Ellington albums I ever heard, when I was getting into jazz in the 1970s. I bought it because I was taking a jazz history class from Richard Davis at the University of Wisconsin and he mentioned in class that his favorite versions of some of the Ellington songs originally recorded in the 1920s are on this album. It's amazing to me that with all of the versions that Jeff has listed, that this is the one he has not heard! At the time that I bought this album, I had less than 50 jazz albums. Gosh! Some amazing responses there. Especially Jeff's - an analysis written in language a lay-person can understand. Will keep this track open until Wednesday and then throw in some obscurities before moving on to "Rockin'" at the weekend. This will be corrected in a matter of days - Historically Speaking is on its way to me from an Amazon vendor. I resent that! Obsessive-compulsive disorder isn't the same as insanity. Is it? I will be interested in your reactions to this album. I think that most people do not think much of the remake of "Koko". I find the remakes of the 1920s pieces interesting, as they tend to be stripped down in their arrangements, and slower. They are not substitutes for the earlier recordings, but are different approaches to them. There is some fine Johnny Hodges soloing on "Historically Speaking". Remedied that by ordering Early Ellington: The Complete Brunswick Recordings. Sadly, it won't arrive before the thread moves on. Nonetheless, delighted to have it speeding my way as we speak. Great choice! There are some lesser tracks, as there would be with any such collection, but there are some real masterpieces there. I love "Creole Rhapsody." Thanks Jeff. Good to know.